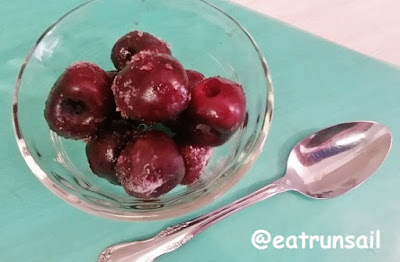 eat run sail: Frozen Cherries... How I Love Them! After months and months of searching local stores, I finally found these lovely frozen cherries! I saw so many posts about them from bloggers in one of my Facebook groups... extolling their perfect texture and delicious taste, that I just had to have them... oh yeah, who SAYS bloggers have no power to influence? Well, I did finally find them, at my local Costco, and I have been eating them by the bagful. 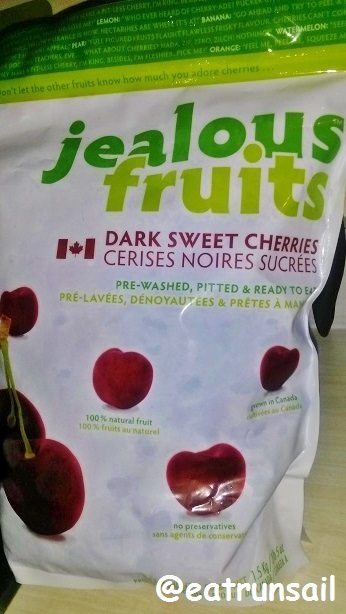 They are grown in my own province and I think I like them even better than fresh cherries. They are already washed and pitted and stemmed and ready to eat. Mmmmm. I often eat them right out of the bag, still frozen! Or I might plop a few in a bowlful of yogurt for an afternoon snack. They freeze the yogurt that sticks to them... it takes forever to eat! I also like them on a heaping bowlful of yogurt mixed with protein powder... vanilla or chocolate... either is delicious! Just look at the juice that comes as the cherries start to thaw. But one of my favorite ways to enjoy them is in a protein shake... a smoothie... they are great with vanilla or chocolate. The color... the taste... amazing! And so very simple and quick to put together. I often have one for breakfast these hot Summery mornings. Blend till thick and creamy. Are you a frozen cherries fan too? What is your favorite way to eat them? I love frozen cherries in smoothies. My fave is with chocolate protein powder and a little coffee to make a cherry mocha! 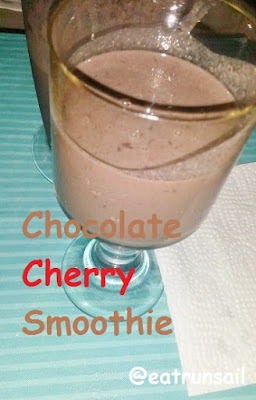 I've been doing the chocolate cherry smoothie for awhile now and I agree it's delicious! I have to check my freezer section for these, they look delicious. Totally the kind of smoothie I would love! I must admit I'm not a huge cherries fan. But I do love the convenience of frozen fruit, especially frozen strawberries. I haven't heard of these! I will be on the look out. I would make a smoothie or sorbet. Looks delish! I love cherries. In everything. 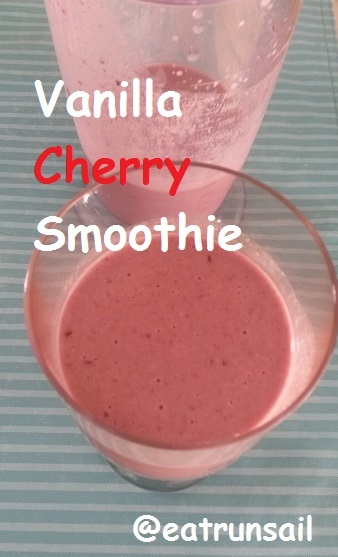 I LOVE CHERRIES & those look amazing as well as the smoothies!!! 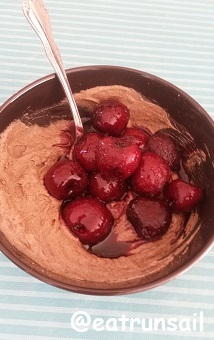 I love fresh cherries but never considered how perfect the frozen version would be for a smoothie. I must give it a try. Mmmm Cherries! Definitely a fruit I really liked when I could eat fruit, yet I did not indulge enough! we ALWAYS ALWAYS have frozen grapes on hand. and now I have no idea why! TIme to break out of our rut.